Reproduction Rights RESTRICTIONS MAY APPLY. United Press Photo. Notes Printed on back: "BIG LEAGUE NOW - SAN FRANCISCO: The cry, 'Play ball!' will have a new sound in Seals Stadium here 4/15 when the San Francisco Giants and the Los Angeles Dodgers take to the field for their West Coast debut. 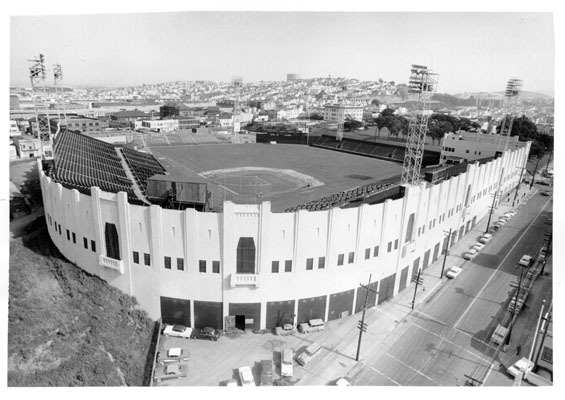 Formerly the home of the San Francisco Seals, the ball park is a temporary dwelling for the Giants until their new stadium is completed at Candlestick Point in South San Francisco. ".